Sony is now not the only company with independent cameras for QX mobile devices, since Kodak has decided this is a game they, too, want to play. The Kodak SL25 features a 16-megapixel backlit BSI sensor along with a 24-600 mm sensor with a 25x zoom. Sadly, we could find out the physical size of the sensor. The Kodak SL10 offers the same 16 MP sensor but a range of 28-280mm and therefore a more humble 10X zoom. Both models offer optical stabilization and can be connected to almost any Smartphone thanks to a universal adapter. They support 1080p video recording at 30 FPS and can be connected to a mobile phone via Wi-Fi. Just like Sony’s models, they don’t have a flash. They’re compatible with Android and Apple’s iOS. They’ll hit the market during the first quarter of 2014 and will cost 300 and 200 USD respectively. 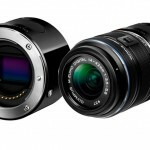 Olympus follows Sony’s steps and presents an external sensor for mobile phones.